You can never have too many one-pot recipes. Plain and simple. 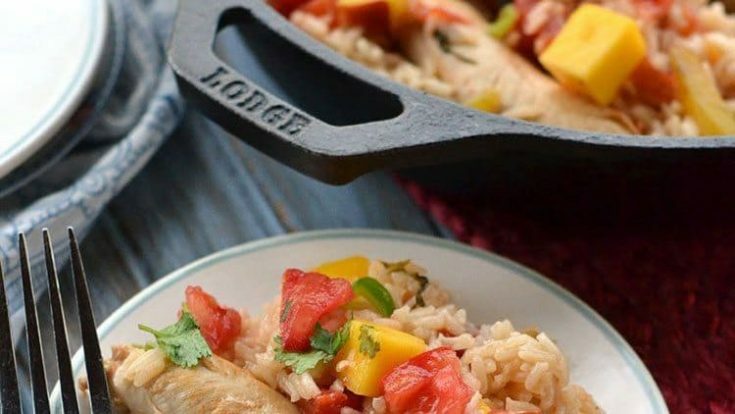 Our One Pot Mango Chicken Recipe uses our fab Mango Salsa recipe, so if you happen to have already whipped up a batch of that, reserve a cup of salsa and chow down on amazing tonight. Rice, chicken, Mango Salsa. See? We’re keeping things basic. And did we mention, colorful? Because there’s nothing worse than surrounding oneself with drab color at meal time. Colorful food, specifically colorful whole food, is tasty, nutritious, and just plain amazing. Take for instance our Mango Salsa. We take simple ingredients (mostly from the garden), put them together, and something spectacular happens. But enough about colorful food. You’ve probably heard all that before. Instead, let’s talk about kitchen cleanup. Cleaning up the kitchen. You know what I’m talking about, even though you probably don’t want to talk about it. And I get it. I HATE kitchen cleanup–with a passion. It would be so much easier if the kitchen would just clean itself. Wouldn’t that be the life? I wish. And wish. And wish. But alas–not going to happen. So, how to alleviate some of the mess? By creating as many one-pot meals as you possibly can. And there are SO many recipes to choose from. Whether you’re looking at slow cooker meals or one-pot skillet meals–there are options. Many, MANY options. Our Mango Chicken Recipe is just one of many recipes that will keep your stack of dishes down and your sanity in check. Because we don’t want you going crazy over a pile of dishes. Trust me, I’ve been there. Recently in fact. (Pile of dishes–not the crazy part!). Dishes stacked up all over the place to be washed because our dishwasher decided to break down for the second time in the span of a few months. Because dishwashers can make conscious decisions like that, you know. Um. Yeah. Mango Salsa Recipe is also perfect for using with fish. Yum! So, maybe not. Regardless, one pot meals can be a life saver whether the dishwasher is on the fritz or not. And let me start by saying, if your dishwasher is on the fritz- call the repair people as soon as it happens instead of putting it off. Which I have done both times that it broke down. For NO reason. Because it’s under extended warranty and I’m not going to have to pay a dime anyway. Because, let me tell you, that is another stinky mess that you really don’t want to have to deal with. EVER. And now I’m going to go call in the dishwasher repair people. For real. Fingers crossed they will give me a new dishwasher since this is the second time it has broken down in a few months–WITH THE SAME PROBLEM!! In the mean time, until it gets fixed, I’m going to need some more one-pot meals. What’s your favorite one-pot recipe? In a large skillet, fry chicken until brown. Add in 2 cups of chicken broth and bring to a boil. Add rice and mango salsa. Put on a low heat and cover for 20 minutes or until rice is tender. Serve and enjoy. Is this 1 cup UNCOOKED rice or COOKED rice?